With beautiful detailing and the work of highly talented weavers on display, Faro rugs are a simple yet stylish way of adding colour and texture to your home. Circular in shape and available in a choice of colourways, as well as being reversible, the Faro rug is practical and it is an easy way of incorporating more colour and warmth to your home. 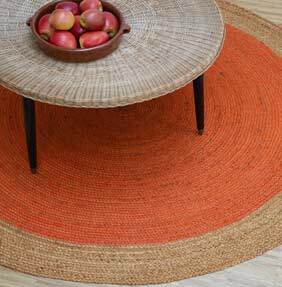 Each Faro Rug features two colours, the outer border contrasting with the inner circle and each rug is constructed from 100% Jute which has an attractive natural sheen. Each Faro rug has been hand braided with care by professional weavers in India and they are both durable and stylish. The Faro Rug is part of the Natural Weaves Collection by Asiatic Rugs and the whole range is a celebration of flatweave designs which utilise naturally sourced fibres and yarns.